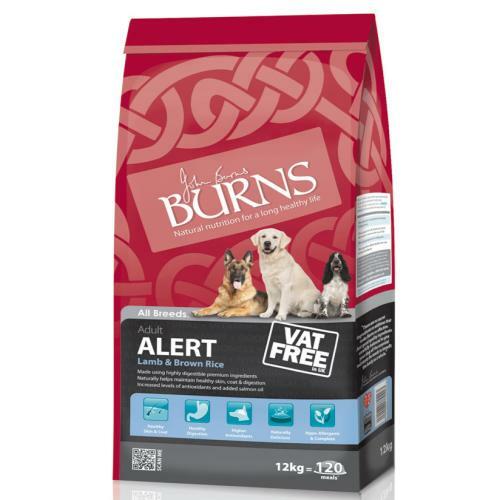 Burns Alert Lamb & Brown Rice is designed especially for hearing and guide dogs, providing your pet with complete nutrition. Suitable for adult dogs over 6 months of edge, Burns Alert is enriched with salmon oil, and green tea as well as Vitamins C & E, ideal for improved mental function. A hypo allergenic food made from quality chicken and wholegrain rice, Burns Alert is free from artificial colours and flavours, minimising occurrences of itchy skin, tummy upsets, bad breath and excessive moulting, instead promoting the production of friendly intestinal bacteria for prime digestive function, and helping your four legged friend to maintain a glorious, luxuriant coat. Brown Rice (58%), Lamb Meal (24%), Oats, Peas, Sunflower Oil, Salmon Oil (0.93%),Seaweed, Vitamins & Minerals, Green Tea Extract, Grape Seed Extract.